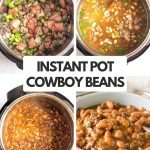 Instant Pot Cowboy Beans - from scratch with dried beans! 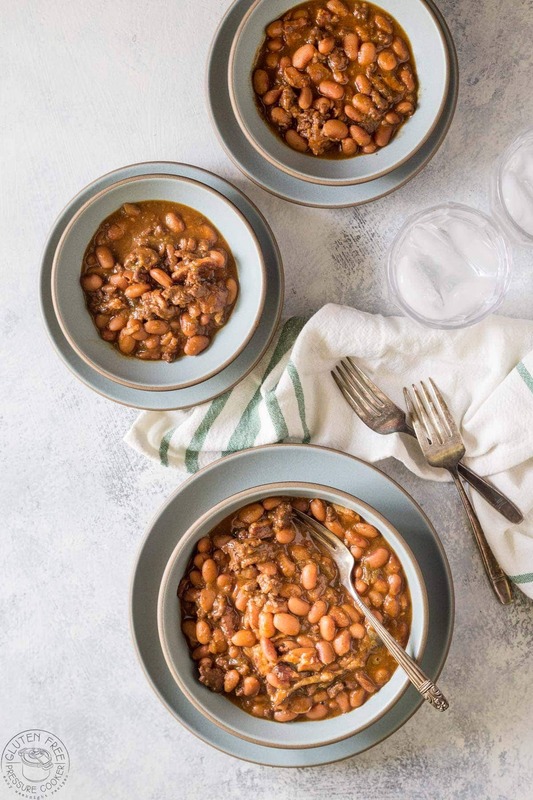 Instant Pot Cowboy Beans truly are the best kind of comfort food, I can’t get enough of them and my boys demolished several bowlfuls in one sitting! 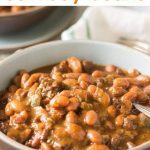 The recipe is packed with Pinto Beans, onions, bell peppers, thick cut bacon, ground beef and seasoned with ancho chili powder. The pressure cooker makes cooking beans an absolute breeze. 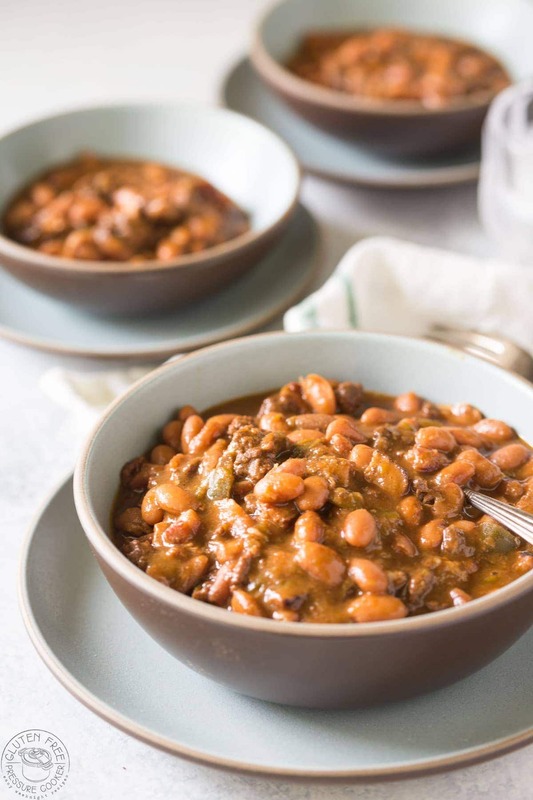 My Instant Pot Cowboy Beans were really easy to make with presoaked pinto beans and the texture of the beans was very creamy and delicious, I don’t think I’d ever cook beans on the stove again! Start by soaking your beans for 8hrs or overnight, this will yield the most consistent results and create more evenly cooked beans. When you are ready to cook, I like to cook the bacon pieces first. I find it easier to cook the bacon in a large skillet instead of in the pressure cooker. 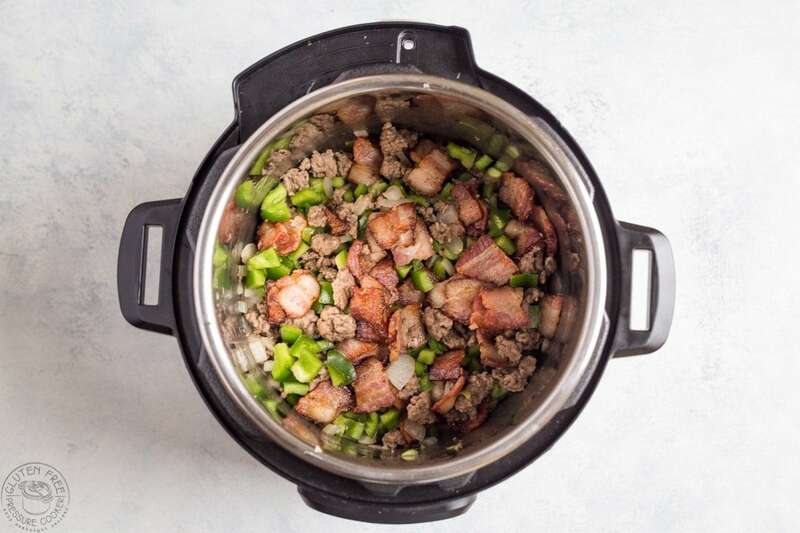 At the same time you’re cooking the bacon you can be browning the beef with the onions and bell peppers in your pressure cooker. Then whisk together the gluten free Worcestershire sauce, brown sugar, molasses, yellow mustard, BBQ sauce, Ancho Chili Powder, and gluten free beef broth into a bowl or jug and pour over the ground beef mixture. When the cook time is up you’ll need to let it sit for at about 35 minutes more, this contributes to the cook time so don’t release the pressure early! Then, release any remaining pressure and take the lid off. Your beans should be tender but may just need a tiny bit more cooking which will happen when you simmer them. At this stage there will still be a lot of liquid in the pot so we need to reduce that. Turn on the saute function and simmer for about 20 minutes or until the liquid has reduced and it has thickened up like you see in the photo below. Now they are ready to serve! Can I pressure cook Pinto Beans without soaking them? Yes, but it’s not my preferred way to to cook them as you’ll likely find that you have inconsistent results in the way that the beans cook. Some may be underdone, and others could be overcooked in the same batch. The other problem is that the time needed to cook them seems to vary wildly from one batch of beans to the next. 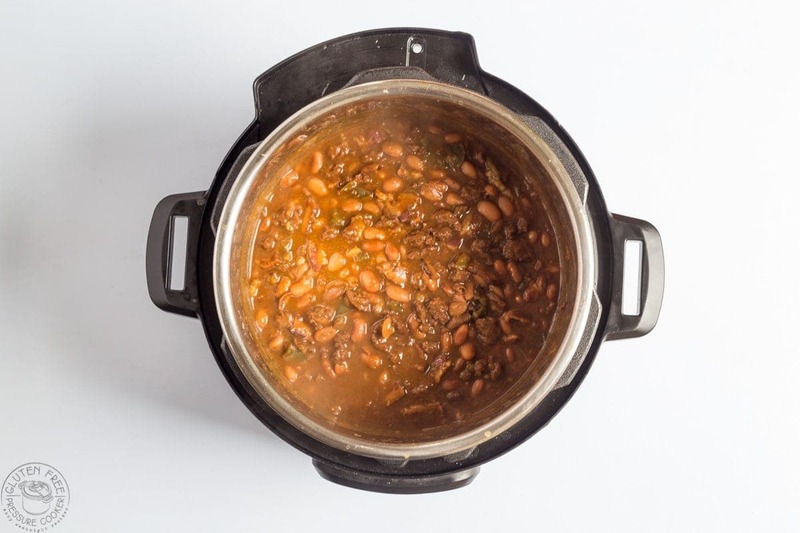 A quick glance in the comments sections of most recipes for no-soak pressure cooker pinto bean recipes shows that folks are having issues with beans being underdone even with extended cook times of up to 50 minutes in some cases, and that’s been my experience too. The moral of the story is to soak your beans in the morning before you go out to work and they will be ready to cook when you come home, or you can soak them overnight to cook in the morning. Pre-soaked beans give much more even results when they are cooked so it’s worth planning ahead just a little bit! Instant Pot Pressure Cooker – Any electric pressure cooker will work to cook my pressure cooker cowboy beans, I have a 6qt Instant Pot. Pinto Beans – I used dried beans to make this recipe. Sharp Knife – I have a large kitchen knife that is similar to this one. 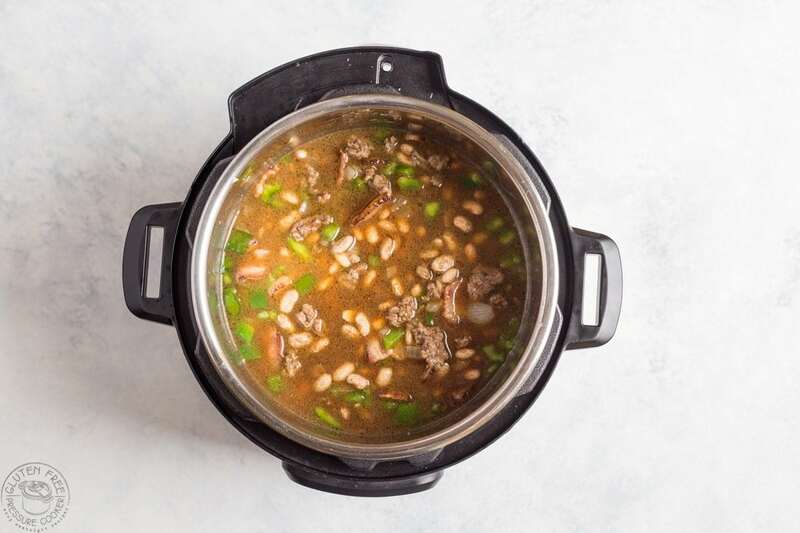 Easy recipe for Instant Pot Cowboy Beans, the perfect comfort food and a great side to serve at your next cook out! Soak your Pinto beans for at least 8 hours at room temperature, then discard the water and use as directed in the recipe. Saute the bacon pieces until crispy, remove from fat with slotted spoon. You might find it easier to do this in a large skillet. Turn on the saute setting in your Instant Pot. Saute the onions, bell pepper, and beef for a few minutes until the beef is brown, then turn the saute off. Mix together the gluten free Worcestershire sauce, brown sugar, molasses, yellow mustard, BBQ sauce, Ancho Chili Powder, and gluten free beef broth. Add the pre-soaked Pinto beans, beef broth mixture, and the cooked bacon to the pot and mix well. Lock the lid, turn the steam vent to 'sealing' and using the 'manual' or 'pressure cook' button, adjust it to cook for 8 minutes at high pressure, then let it do a natural pressure release for 35 minutes, then release the remaining pressure. Due to the volume, it will take about 25 minutes to come to pressure. After you've released the pressure and removed the lid you will need to simmer it on the saute setting for about 20 minutes for the liquid to reduce and the sauce to get nice and thick, don't skip this! Please read the paragraph in the post for more details on this. I don't recommend using un-soaked beans as the results are not always consistent. If you do want to go that route, then I'd cook the beans separately for 40 minutes, then let the pressure cooker sit until the pressure drops. Then I'd use the beans in the recipe as written. However - I have NOT tested the recipe this way and I cannot guarantee it will work! I really recommend you soak your beans for 8hrs or overnight for best results. This assumes you are using pre-soaked beans as recommended. I used a 6Qt Instant Pot to cook them. 20 minutes further simmering to thicken up. Just made these and we loved them! Came out very yummy and even my husband who isn’t a big “baked beans” fan enjoyed them! This has been printed out and is in my IP recipe binder now. We don’t eat pork. What can I substitute for the bacon? Hi Sarah, I can’t think of a suitable substitute so I would just omit the bacon and the cowboy beans will still taste great! My apologies, I’ve edited the recipe to fix that, you add the bacon back in when you add the presoaked beans, just before you pressure cooker them.